This CD-ROM, a companion to Len Silverston's The Data Model Resource Book, Revised Edition, Volume 1, arms you with a powerful set of data models and data warehouse designs that you can use to jump-start your database development projects. It will save you countless hours and thousands of dollars in database development costs by providing the SQL code you'll need to implement the models described in the book or reverse-engineer them into your CASE tool. You'll get actual proven models for such common business functions as ordering and managing products, handling shipments, invoicing, accounting and budgeting, managing human resources, contact management, and project management. Plus, you'll find new and expanded models for call center management, product customization, shipping and receiving, payments and collections, budgeting scenarios, and employee qualification and performance. New data mart designs are also provided in this revised edition, including financial analysis, inventory management, and shipping logistics. You'll also want to check out The Data Model Resource Book, Revised Edition, Volume 2 (0-471-35348-5), and its companion data model sets (each sold separately), which feature universal data models tailored to various industries and applications. 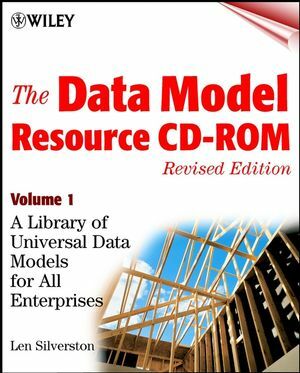 A free demonstration of the Volume 2 Data Models is available on this CD-ROM product. 32-bit operating system such as Windows 95, Windows NT 4.0 or higher. 25 MB required space for installation of files. CD-ROM drive. You also will need to have the following applications to make full use of the CD-ROM: a browser such as Microsoft Internet Explorer to open the readme.htm and navigate the demo; Visio 2000 required to view the images of the models in native format, although they can alternatively be viewed as JPEGs in a browser or another application. LEN SILVERSTON (lsilverston@univdata.com) is founder and owner of Universal Data Models, LLC (www.universaldatamodels.com), a Colorado-based firm providing consulting and training for helping enterprises customize and implement "universal data models" and develop holistic, integrated systems. Mr. Silverston has over 20 years of experience in delivering data integration, database, and data warehouse solutions to organizations.